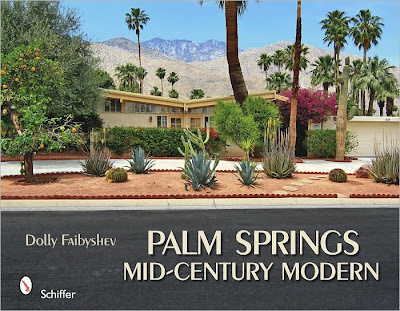 Schiffer Publishing is about to release Palm Springs Mid-Century Modern, a new book on Palm Springs, on June 28th, 2010. The book will be illustrated with 178 photographs (both color and black/white) which present the brilliant mid-century modern architecture of Palm Springs in California. The desert environment and Hollywood stars inspired architects of the day to creative heights, including Donald Wexler, E. Stewart Williams, William Krisel, Albert Frey, William F. Cody and Richard Neutra. Written by Dolly Faibyshev, a photographer who explores themes of suburbia, isolation, and the conquest of the American Dream.